On October 20, the Church celebrates the memory of St. Matrona of Chios (also called “Saint Matrona Chiopolitida”). 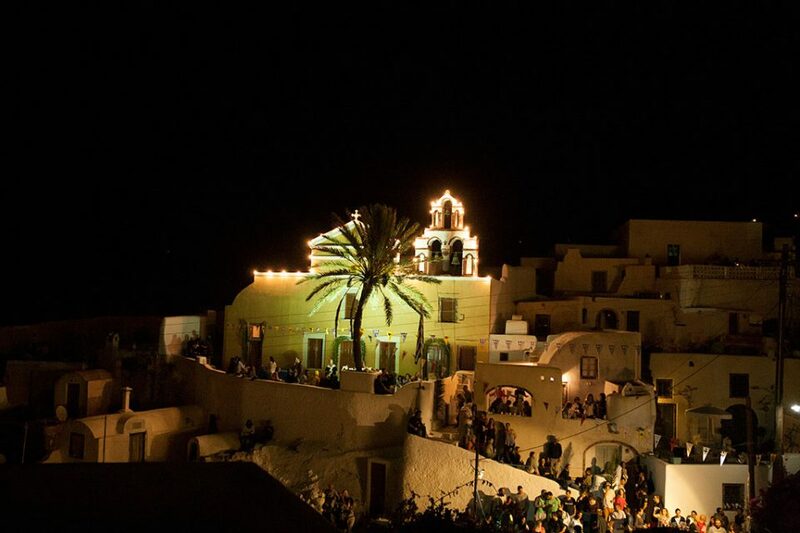 On the eve of the feast, on October 19, after the vesper at the church of Saint Matrona Chiopolitida in Finikia, Oia, one of the most beautiful traditional festivals of Santorini takes place. The old kanaves (the undergroud wineries and wine cellars of Santorini) get crowed again, and all the otherwise empty streets and buildings, the “rivers” as the locals call them, overflow with people coming from the four corners of the island. The feast lasts until the the next morning under the sounds of the lute, the violin and the tsabouna. On the feast day, after the morning service, the litany of the icon takes place around the alleys that have been paved with rosemary and sweet-scented pelargonium. After the treats and the morning coffee, in the church courtyard with the characteristic palm tree, delicious food is served for every one to enjoy. The Holy Church of St. Matrona was built in 1859 by Francis Plati, a shipowner from Oia, in an amphitheatric location of the settlement of Finikia. In the church courtyard there is a palm tree, the reference point of the settlement. Finikia was formerly the rural settlement of Oia. There lived the farmers so as be near their meadows and fields, and there, in the famous kanaves, not far from the vineyards, some excellent wines were produced.